And this is how it looks on my nails! Since my nails are longer than the hand model shown, it will look a bit different! Did you give the tutorial a try? 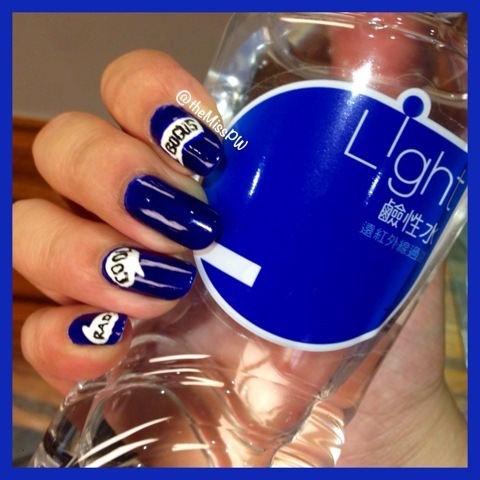 I love the contrast between the colors on the accent nail and the cat is just a perfect addition! Looking at my recreation, I think my fence boards could have been a bit thicker! Those fences won’t be keeping anything out of anyone’s property!!! Hope you have a very Happy Halloween! I decided to get a little more intricate with my Breast Cancer Awareness nails this year and did some research about the risk factors as a way to spread knowledge through nailart. It really is so important to be aware of the risk factors and do all that we can to live healthier lives. 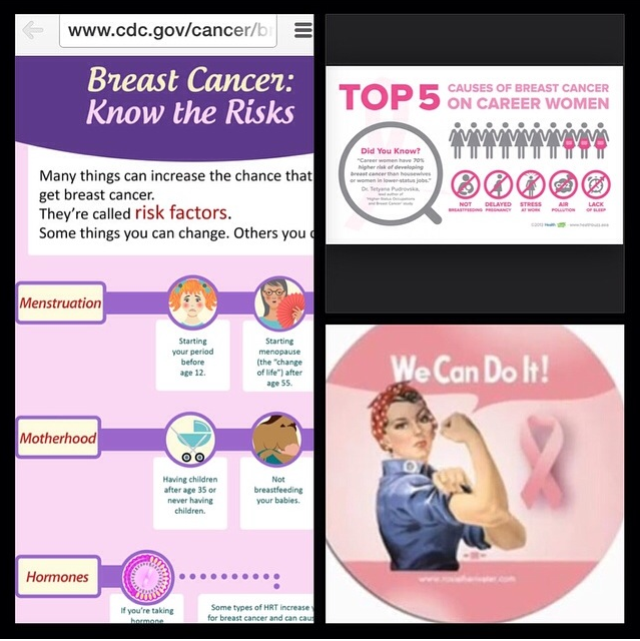 Do you know anyone affected by breast cancer? What changes can you make to your life that can benefit your health? Hey everyone! 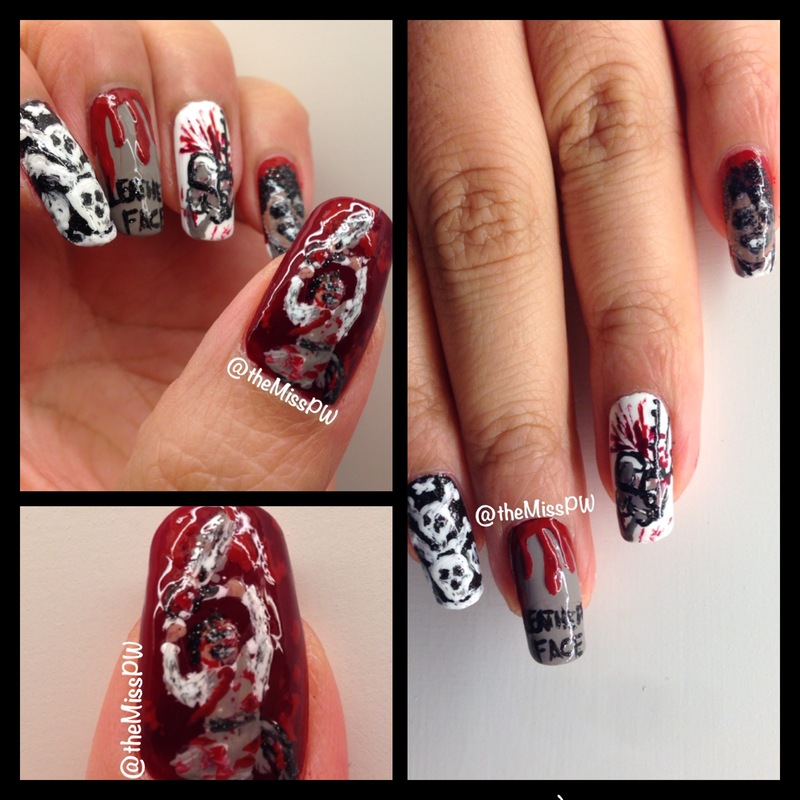 With Halloween fast approaching, I’ve been really inspired to go a bit darker and make lots of my nail designs more sinister, creepy and… gory. With the start of fall, I gravitate towards darker colours and this year is no exception. My colour crush this season is deep, dark oxblood red and I’ve searched my stash for one that is perfect, but came up empty-handed. I think Nic from Julep would be a really gorgeous polish that perfectly fits that deep, vampy dark red colour category. I’ll have to add that one to my wish list! I don’t have too many Julep polishes in my collection, and just browsing the colour selection on their website, I think Beatrix, Cleopatra and Austen would also be amazing polishes to sport at this time of the year. 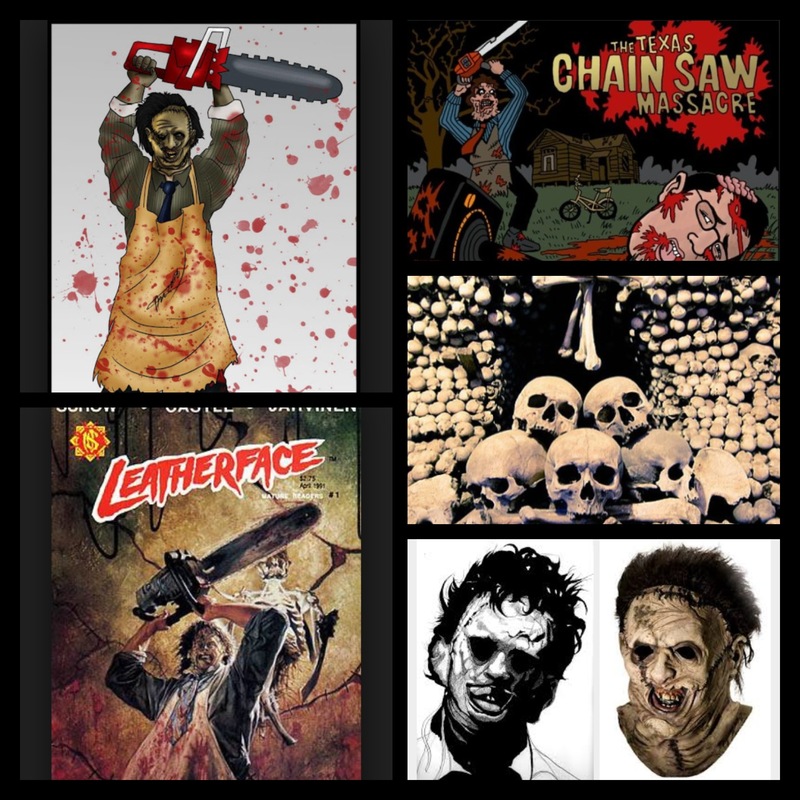 I first used Google to search for “evil villains in halloween movies” and stumbled upon a top five list that featured a character from the Texas Chainsaw Massacre series known as ‘Leatherface’ – one look at his sinister face (complete with decaying flesh of one of his victims as a mask… gross!) 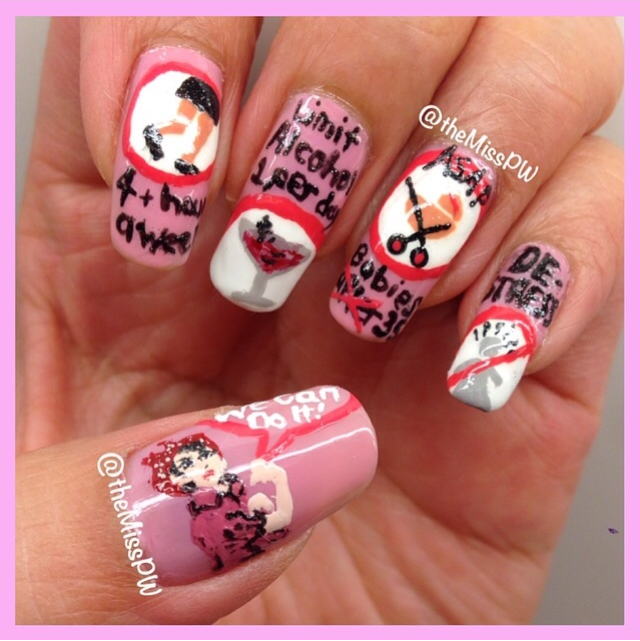 I knew that I wanted to use this character to create a manicure for a nail art contest! On the thumb I portrayed Leatherface using his chainsaw for a killing rampage, the index/pointer finger shows the bones of victims that were used to decorate the inside of the Sawyer household, the middle finger has drippy blood sliding down the nail, with the word ‘leather face’ written below, while the ring finger is my attempt at a chainsaw (with added blood squirting out all over the place) and the pinkie is a close up of Leatherface wearing his signature face mask. I have to admit, I’m scared to watch scary, gory movies because my mind will start to play tricks on me. 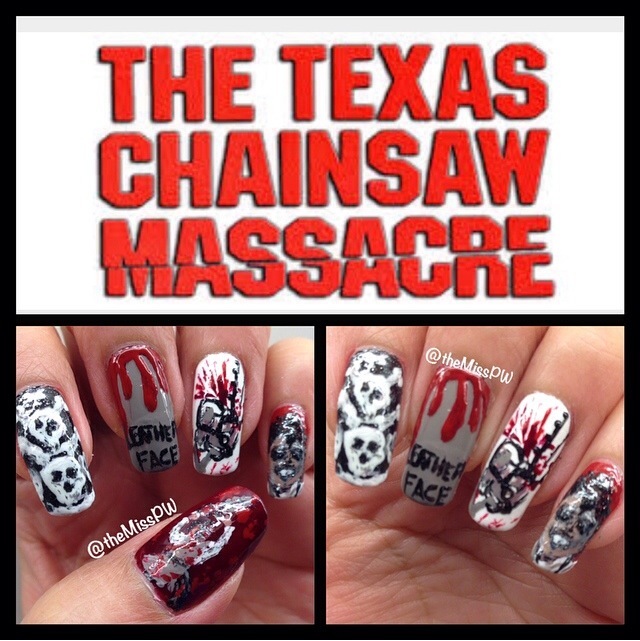 So, just doing research online for this nail look really creeped me out. 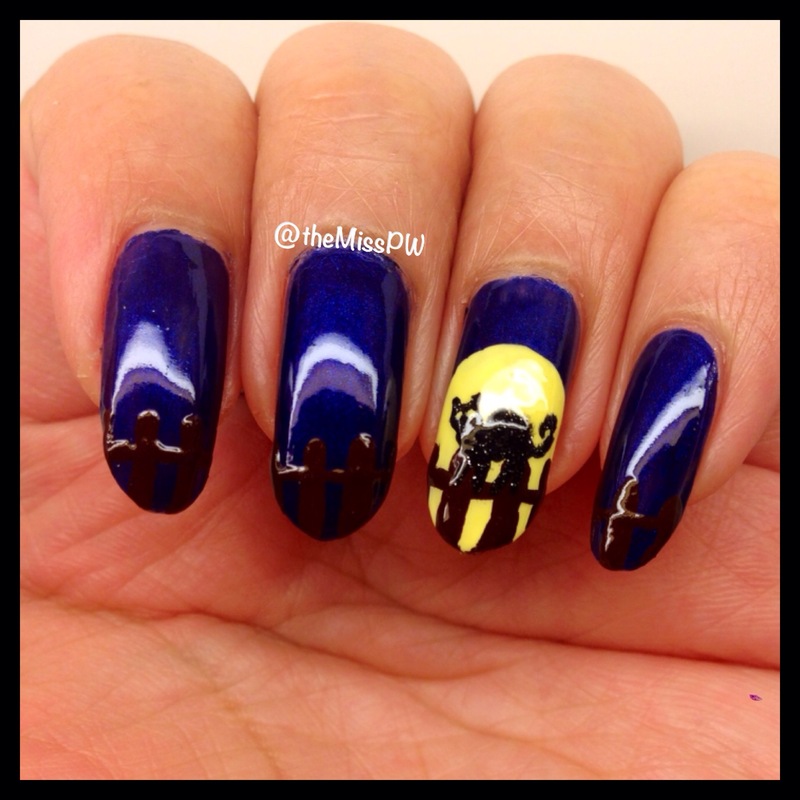 Do you think I was able to capture the essence of the movie franchise with my manicure? 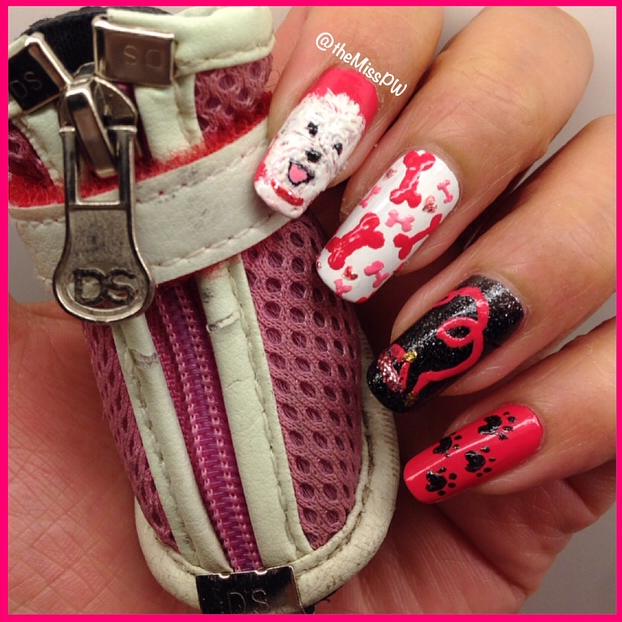 What Halloween manis are you sporting? What spooky, creepy, thrilling movies/shows do you like to watch to freak yourself out? Let me know in the comments! I have been dog sitting for the past week and despite all the daily walks, pooper scooper duty and random barking, I’m really loving the time I get to spend with this adorable little dog named Lila. Using her dog leash as my color inspiration, I decided to dedicate a manicure to her! 😦 What are your thoughts? 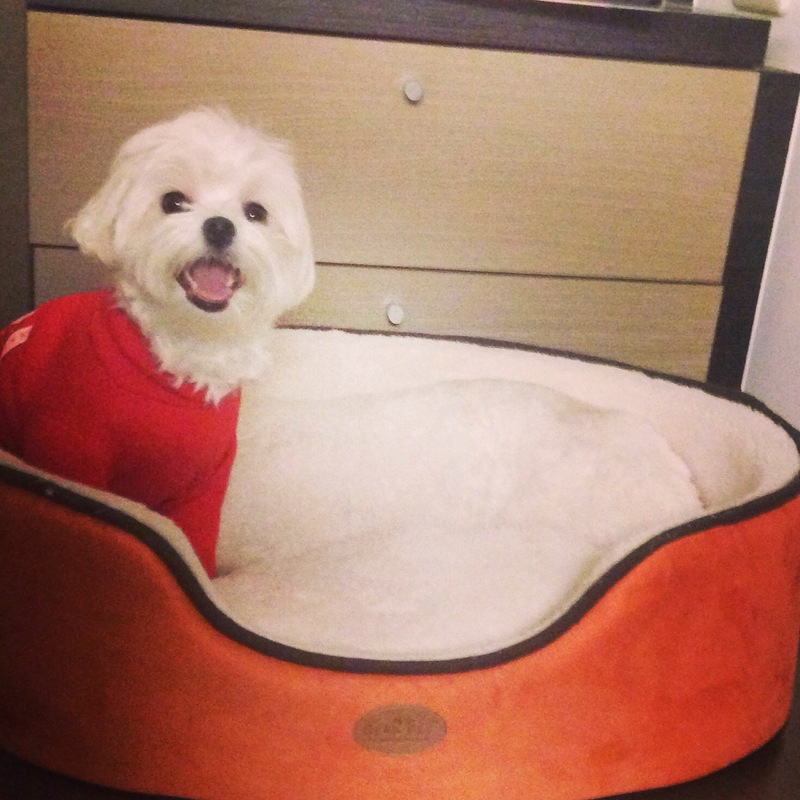 I entered this design into an Instagram contest too… Let’s hope Lila can bring me luck! 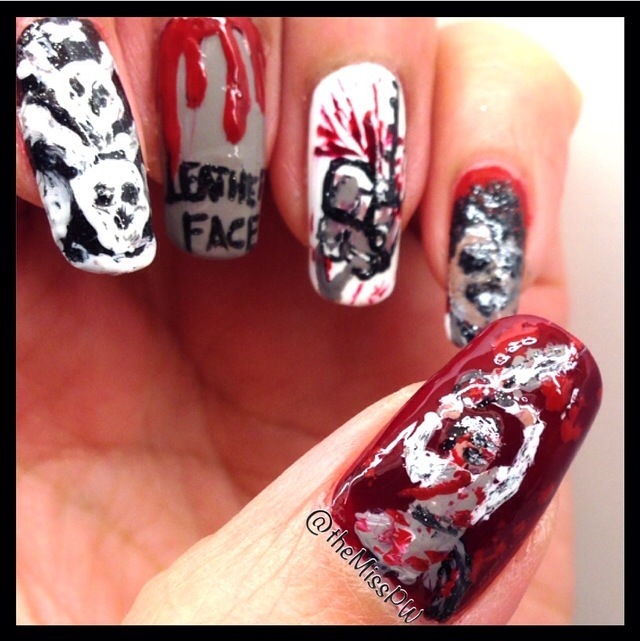 Here is my take on the gory and bloody nail art that accompanies my hand painted (no acrylic paint! 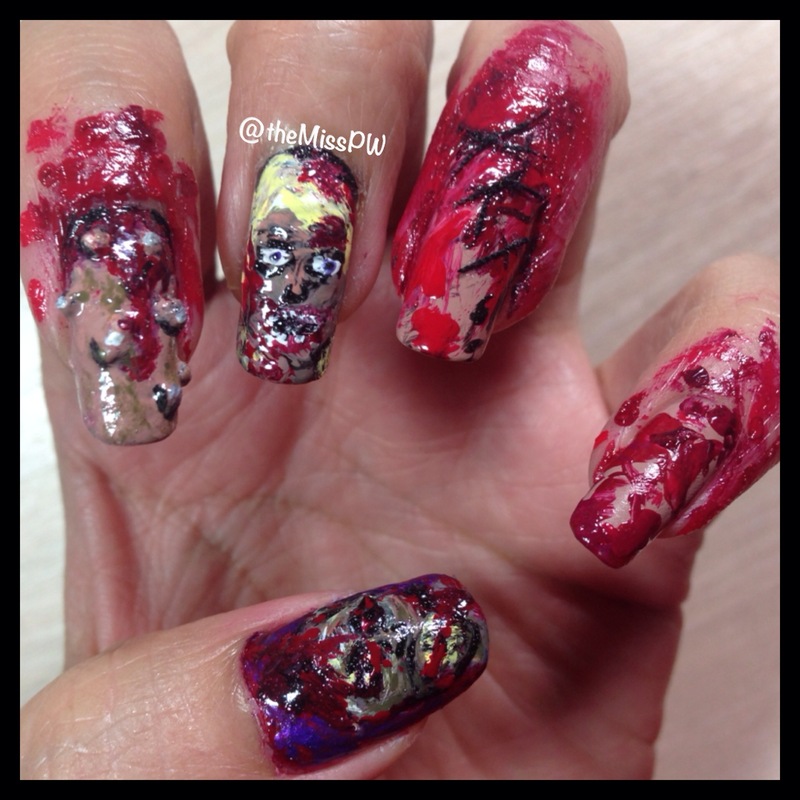 All done tediously with nail polish…) ZOMBIE nails! The ring finger with stitches and bloody nail damage is a recreation from a recent Elleandish tutorial. 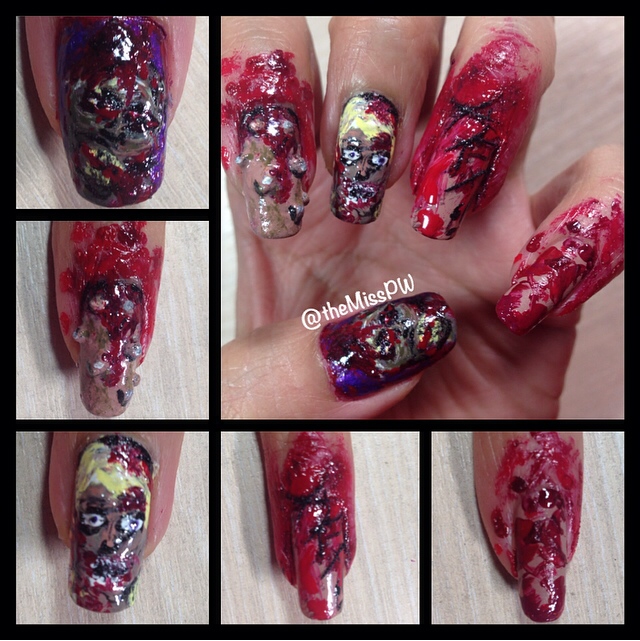 This video is also on YouTube – search for “Halloween Gore: Stitched Nails (No Fake Nails needed) for a cool and fun scary nail look! I painted the zombies from some google images… which were super hard to paint! So I was so exasperated that I just decided to wing it, because I was tired of looking at creepy zombie photos after creepy zombie photo. I intended to draw a glacier, but it turns out I don’t know the difference between icebergs and glaciers! 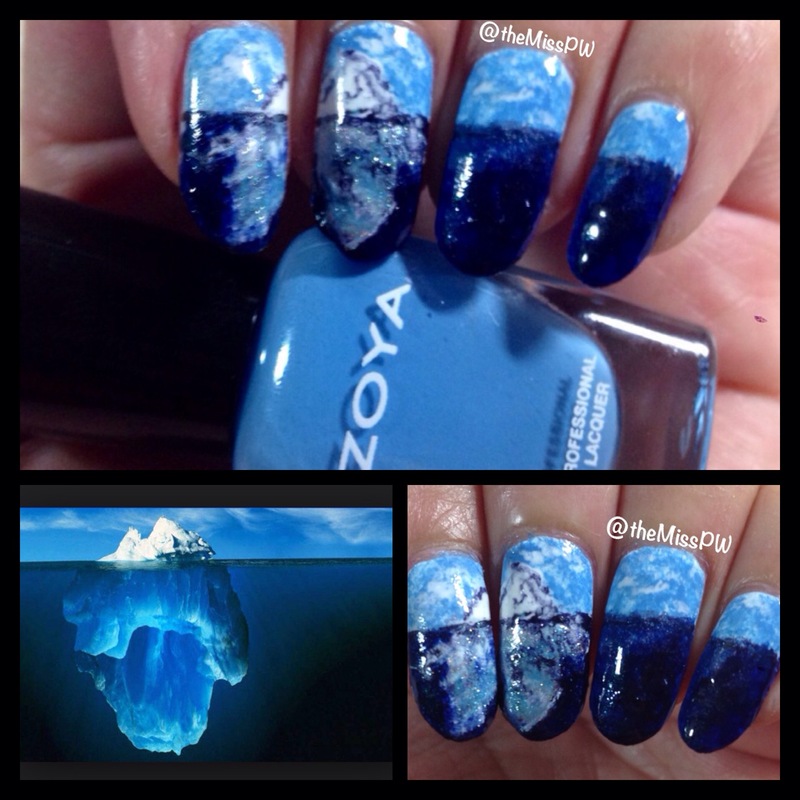 An iceberg is what happens when a piece of the glacier breaks off and floats off into the ocean. I did everything with polish, and sponged over a white base. Let me know what you think! I tried to create butterflies using only dots (some dots on my pointer finger were not well formed, so it’s a lot blobbier…) I think the pinkie butterfly is the best one – that is the one I did last haha! Skydiving is a fun, crazy and adrenaline pumping activity… But I’m too scared to try it. 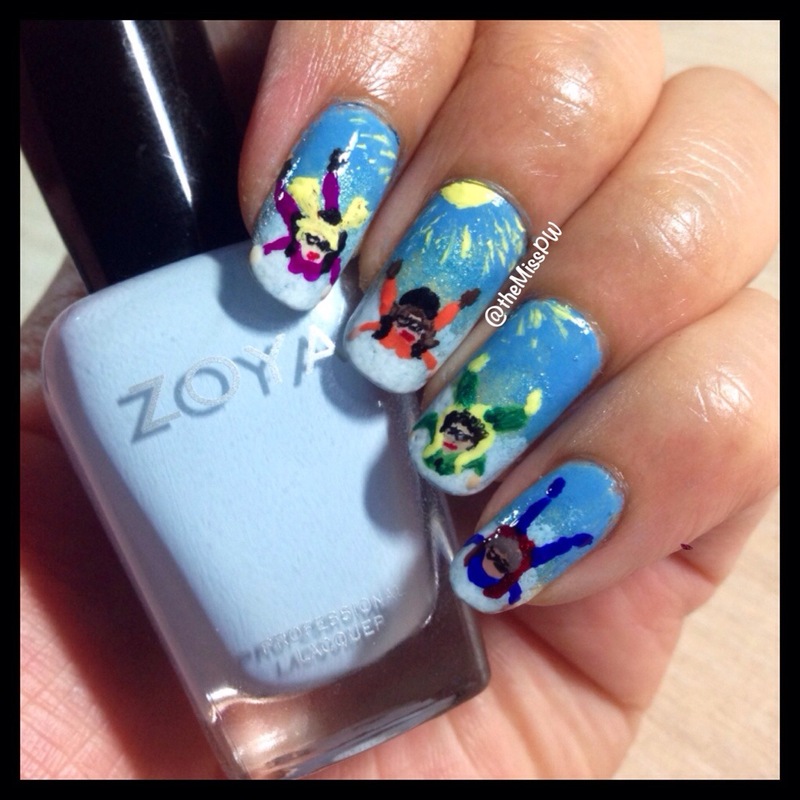 Instead, I’ll stick to drawing out tiny figures on my nails via skydiving nailart! Thanks for inspiring me @nailsbykathi!! 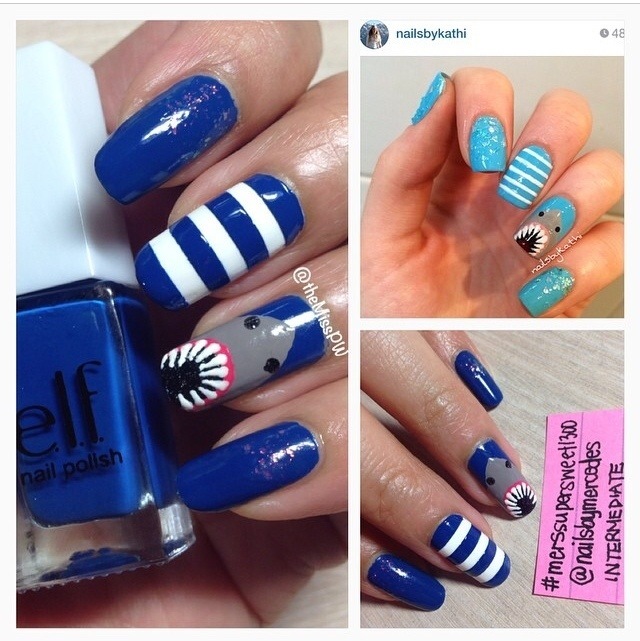 I changed the blue color used in the manicure and I also altered the width of the stripes. I don’t have the same glitter flake nail polish, so I had to improvise! Here is a manicure that I did with my non dominant hand! I spent a really long time getting those speech bubbles and the lettering just right! It was inspired by a cute blue one piece swimsuit from the 2015 Wildfox Swimwear line! Do you like the design? 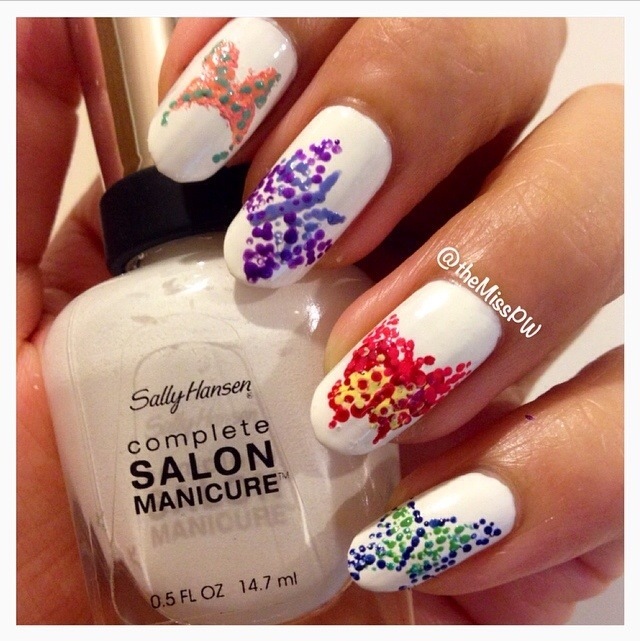 Categories: Manicures | Tags: NailArt | Permalink.